Newsletter 229: Make your dreams come true! 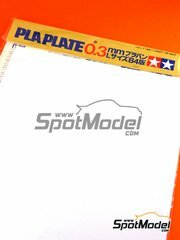 Tamiya want to help all of us making "scratch" parts with polystyrene sheets in different sizes and thicknesses that you can cut, glue, deform and paint as you like. You have surely dreamt about them more than once! 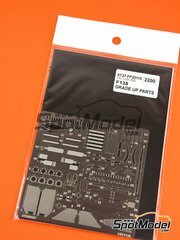 Pack of 5 sheets of transparent polystyrene for manufacturing your own parts. The dimensions of each sheet are 26x36 cm in surface, and 0.2mm thick. 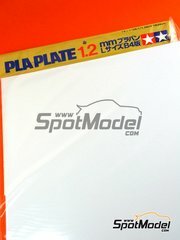 Pack of 5 polystyrene sheets for creating your own parts. Sheet dimensions are 26x36cm long by 1.2mm thick. 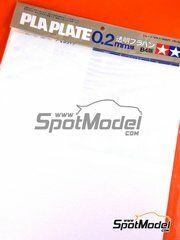 Pack of 5 polystyrene sheets for creating your own parts. Sheet dimensions are 26x36cm long by 1.0mm thick. 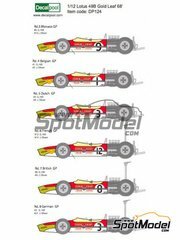 Finally you can get all the decals you need for decorating your Lotus 49 just like any of all the races competed under Gold Leaf sponsorship. 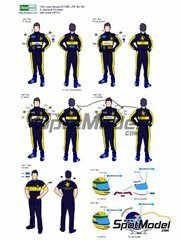 Decoration including all logos used by Lotus team on its crew and pilots suits during 1985 and 1986 seasons. 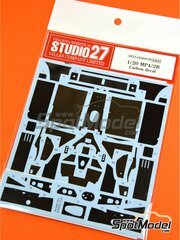 Photoetched parts set for enhancing Fujimi Ferrari 150 Italia, including brake discs, harness buckles and fabrics, radiator grids, and many others. 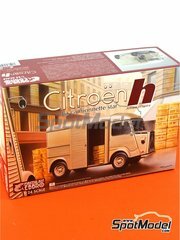 Parts for upgrading Heller's Citroën Mehari to the "Gendarmerie" version. 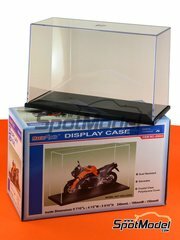 Plastic case specifically designed for your 1/12 scale model bike kits, measuring 246 x 106 x 150 mm (displayed bike is NOT included). 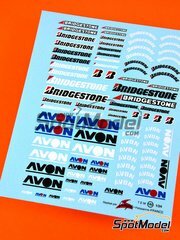 An extensive decals sheet with a good pile of Avon and Bridgestone tyre manufacturers logos. 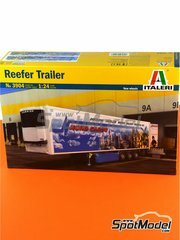 A gorgeous and huge modern closed reefer trailer like the ones used all along Europe for transporting food and perishable goods. 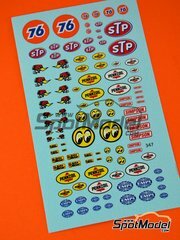 American STP, Empi, Pennzoil and Simpson brands logos. 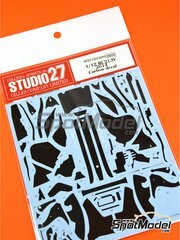 Enhance the beauty and realism of Tamiya scale model with this set of two decal sheets with the carbon fiber patterns specifically designed by Studio27 for the RC213V. 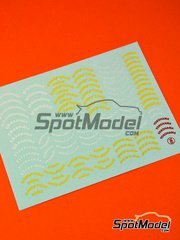 Set of 3 decal sheets featuring the carbon fiber and kevlar patterns used in the l McLaren MP4/2B TAG Porsche, specifically designed for Aoshima scale model kit. 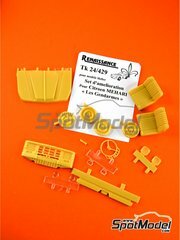 Photoetched parts and seatbelt fabric for Fujimi Ferrari F138. 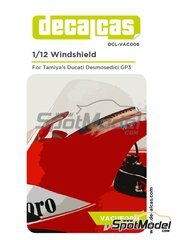 Ducati Desmosedici GP3 '03 windshield made of 0.2mm transparent laminated material, for replacing the transparent plastic parts of your kit. 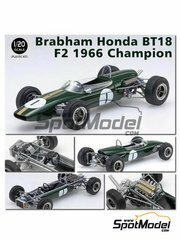 You will achieve a more realistic look on your kit, both for the reduced thickness (much closer to reality on that scale than the original transparent part) as well as for its shininess and transparency. 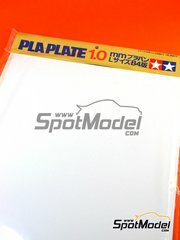 Windshield comes already cut, fitting your model perfectly without any additional cutting. 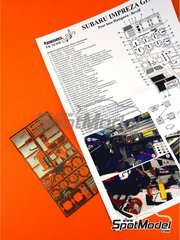 Set of photo-etched parts for both of the interesting kits of the Subaru Impreza WRX by Hasegawa and Heller. 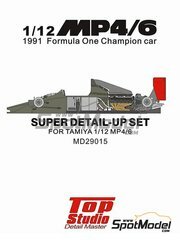 One pack that binds together the different detail up sets edited by Top Studio for Tamiya McLaren MP4/6. Here we have one of the most surprising kits that have passed through our warehouse in recent times. 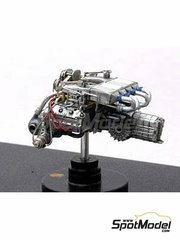 The molds used to make this model are made of several "bodies", producing parts that can not be manufactured in any other way. Just take a look at picture number 8 and try to believe it!!! 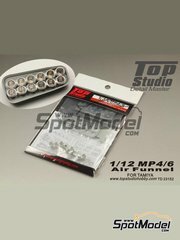 Air funnel set for Tamiya 1/12 scale MP4/6 scale model. Including deliciously detailed and reproduced resin and turned metal parts, as well as small photoetched parts for butterfly valves. 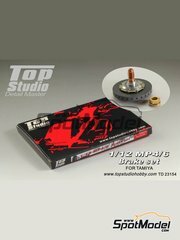 Enhancement set for Tamiya 1/12 scale MP4/6 brakes. 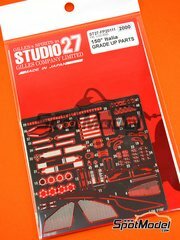 Including deliciously detailed and reproduced milled and turned metal parts, as well as some small photoetched parts.